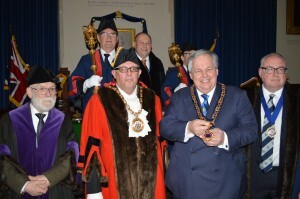 It is an enormous privilege to have been installed as High Steward of Banbury. I am also grateful to the Lord Lieutenant of Oxfordshire for recently having appointed me a Deputy Lieutenant for the county. “ . . . at least a Knight” ! I am very conscious that in the succeeding years, this post has been held by men of outstanding public service and the strongest of local connections. I was proud and privileged to represent Banbury in Parliament for 32 years. Indeed with the exception of Lord North, the Member of Parliament for Banbury who was Prime Minister, and who had the misfortune to lose the American Colonies, I am the longest-ever serving Member of Parliament for Banbury, and Lord North, who was MP for 37 years, had only 18 constituents ! Before the present Lord Saye’s father became High Steward, one of his immediate predecessors was Lord North of Wroxton Abbey who on his 90th birthday, became the oldest living member of the then House of Lords. There is a wonderful photograph in the Banbury Guardian of the time of Lord North of Wroxton Abbey and the then Lord Saye of Broughton, entitled “Two High Stewards, two political opponents, and two old comrades”. The then Lord Saye had gone to Wroxton to congratulate Lord North on his birthday and the then Lord Saye was at the time himself High Steward of Oxford, hence the two High Stewards. They had both fought in the Great War, hence the two old comrades, and as we all here will know, the North family were generally Conservative and the Saye and Seles had traditionally Liberal, with one of Lord Saye’s predecessors being particularly active in the passing of the Great Reform Bill of 1832. For reasons that now seem to be lost in memory and of which no record can be found, when Nat Fiennes’ father died in 1968, for some reason, no one was appointed in his stead as High Steward, so I am very grateful that this ceremonial, civic, post has been revived and also grateful to the personal support and endorsement of my appointment by the present Lord Saye, whose public service, I would note, along with Lady Saye, over the years, to the local community has been absolutely outstanding and it is noteworthy that notwithstanding that Lord Saye is now 95, one regularly sees him supporting civic events. I am very conscious of the example of those who have gone before me that they have set a very high standard. The specific duties that go with this post I understand are few. But having also recently been made a Deputy Lieutenant by the Lord Lieutenant, I hope that I will be able to combine both these duties and responsibilities to help wherever possible support local organisations and charities and all those organisations and initiatives which help strengthen the fabric and wellbeing and flourishing of Banbury. There was some discussion as to what uniform I should wear as High Steward. In the end, it was decided that as I am a Privy Councillor, it would be sensible for me to wear the Day Dress. Pippa is quite pleased because it is a uniform which has the incentive, given its high collar, that, were I to put on weight, it would have the effect of my being garrotted! That is the good news. The bad news is that a Privy Councillor Day Dress seems to take an amazingly long time to make. Anyway, I hope, Mr. Mayor, that my uniform will be ready in time for the Town’s next Civic Ceremonial event, which will be the Inauguration of the new Town Council on Tuesday 10th May. Mr. Mayor, over the years, I look forward to supporting you and successive Mayors – you being the First Citizen of Banbury. Thank you for the opportunity you have given me to continue to serve Banbury and serve this community. There is just one other matter which I should like to raise, which is directly relevant to Banbury. The only Grade One Listed Building in the town is St. Mary’s church. This is an important building, not just in terms of its heritage and as a place of worship, but also as a significant cultural centre, used by a whole range of local arts organisations, such as the Banbury Operatic Society. It is also one of the few places in Banbury in which a sizeable public meeting can take place. As we can see, looking around us, this Town Hall is comparatively small. So when, for example, a number of years ago there was a threat to the future of the Horton General Hospital, as many here will recall, one of the main public meetings to keep the Horton general took place in St. Mary’s church. I think for some time it has been known that water ingress, as a consequence of the soft Hornton stone, had done some damage to the roof of St. Mary’s – as a consequence of which a bid was put in for a grant from the Government’s Listed Places of Worship Roof Repair Scheme – a scheme in which I have a personal interest because this was money for church buildings in England that I had persuaded the Chancellor to make available during the last Parliament when I was Second Church Estates Commissioner. St. Mary’s received the largest possible amount under that scheme – £100,000. What was not such good news was that when the structural engineers carried out a survey of the roof, they found that all, and I mean all, the principal structural timbers, are unstable and without any sound bearing. I think it is not too much of an exaggeration to suggest that if we hadn’t commenced this repair work at this time, there could have been a complete catastrophic collapse of the whole of the roof of St. Mary’s. The architects and contractors have now revised this project to allow for the introduction of new steel work to support the church roof and effectively “retire” the failed timber trusses. However, this extra work, not surprisingly, involves extra costs, and it is estimated that the project is going to cost a further £60,000. I hope that as many people and organisations in the town as possible will feel able to give of their means to the cost of these vital repairs to the roof of St. Mary’s. Mr. Mayor, can I give to you from Pippa and myself, as my first act as High Steward, a contribution to this Fund of £5,000 and I very much hope, Mr. Mayor, that the Town Council will feel able to generously lead the contributions to this appeal given the importance of St. Mary’s for Civic events. St. Mary’s lies at the heart of the community in Banbury and I think we would all wish to ensure that it is structurally sound for future generations and many years to come. Now, may I ask everyone to join me in a glass or two of Champagne to mark the revival of the role of High Steward of Banbury. To read a recent Banbury Guardian article about the High Steward role, click here: High Steward article in Banbury Guardian Brian Little 100316.